Late Monday afternoon, I was in a very bad mood as I was driving up Lake City Way heading into Lake Forest Park. But that all changed after a restaurant’s “Grand Opening” sign caught my eye. Actually, it was the fancy-pants trailer rig parked next to the roadside joint that caught my eye first, but it was the fact that both the rig and the shack bore the words “gator” that led me to make a U-turn. I wasn’t the least bit hungry, but I knew that to drive by this place without stopping to investigate would be a crime. I told him I’d eaten it at a (now-defunct) Japanese restaurant, right down the road from his shack. 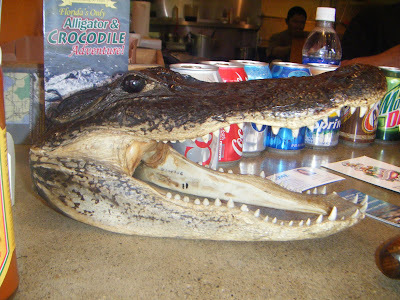 And he looked non-plussed before nodding in agreement, noting that most of the alligator his Floridian gator-farming source sells is flown to Japan, where the Japanese truly appreciate that Southern delicacy. And that’s when I made friends with this handsome fireplug of a man, who’s got 13 grandkids and as nearly as many scars (the last vestiges of a tattoo, gator claw marks, gunshot wounds). He says he’s been catering corporate events out of his big rig for a year or so before plunging into the restaurant business — a business, he says, he knows “nothing” about. Clearly he’s telling a big fat fib, something I figured out two seconds after another customer walked in the door and got the treatment that’s going to make Casper famous — at least in these parts. 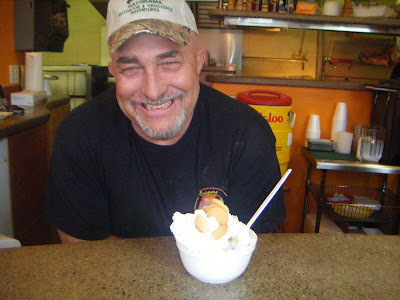 “Ever eaten alligator?” the gal asked him, and when that fella said no, Casper fried him up him up a batter-dipped piece, shoved it on a stick and handed it over. The gator-virgin was told to taste it straight, first, before giving it a squirt of spicy “Gator Sauce” found on squeeze-bottles alongside the barbecue sauce on the few tables in this colorful little joint. 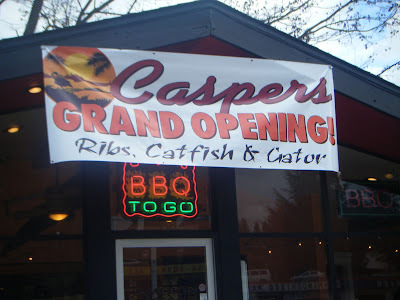 You shoulda seen the guy’s face when he tasted that lean, juicy meat that, says Casper, “is the lowest cholesterol, highest calcium, highest protein you can eat” and, says me, tastes like chicken, only ten times better. That guy’s “mmm-mmm-good”-look bore a striking resemblance to mine after Casper, my new best friend, insisted I taste his tender jumbo fried shrimp (amazing!) and his justly famous Bubba’s banana pudding, made from scratch if you don’t count the Nilla vanilla wafers (astounding!). So, get over there ya’ll. 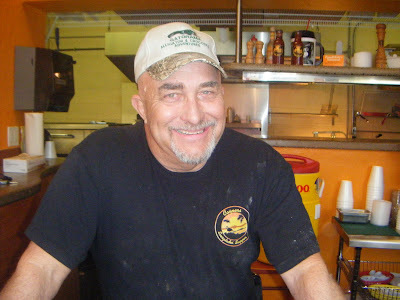 And when you see me elbowing my way in for some frog legs, or catfish, or more of that fabulous gator or Casper’s meaty ribs (“I apologize, if they fall off the bone,” he’ll tell you) make room for me in there, won’t you? You’ll find him at 15030 Bothell Way, N.E., Lake Forest Park, (206) 268-0202. Hours: 11 a.m.-8 p.m. Mondays-Thursdays, 11 a.m.-9 p.m. Fridays-Saturdays.